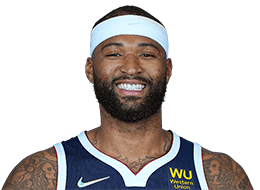 Is DeMarcus Cousins debilitating injury also crippling to the Warriors title chances? The Starters discuss. The NBA TV analysts speak on what the Warriors' next moves are with DeMarcus Cousins out of the lineup. Averaged a team-leading 17.1 ppg (.465 FG%, .182 3pt%, .738 FT%), a team-high 9.9 rpg, 2.7 apg, 1.44 spg, and 30.5 mpg in 75 games (started 74) ... Missed three games due to NBA Suspension (11/11/12, 11/13/12, 12/12/12) ... Missed one game due to team suspension (12/23/12) ... NWT-Coach’s Decision in one game (12/26/12) ... Missed two games due to a left quad contusion (DNP- CD on 3/13/13, NWT on 3/17/13) ... Ranked 9th in NBA in rebounding ... Scored in double-figures in 62 games, 20 or more points in 28 games, 30 or more in three games ... Grabbed 10 or more rebounds in 38 games, 20 or more in two games ... Dished out 10 or more assists in one game ... Recorded 35 double-doubles ... Recorded one triple-double (12/30/12) ... Led Kings in scoring in 26 games, rebounding in 48, assists in 15 ... Top Single-Game Performances: In final regular season game, recorded game-high and season-high 36 points (14-24 FG, 8-11 FT), a game-high and career-high 22 rebounds (career-high 18 on defensive end), three assists, and three blocks in 41 minutes vs. LA Clippers (4/17/13) ... Recorded 34 points (12-16 FG, 1-2 3pt, 9-9 FT), a game-high 14 rebounds, two assists, one steal, and one block in 30 minutes in a win at Phoenix (3/28/13) ... Tallied 31 points (11-18 FG, 9-12 FT), 20 rebounds, four assists, and two steals in 33 minutes in the road win at Toronto (1/4/13) ... Had first career triple-double with 12 points (4-12 FG, 4-4 FT), 10 rebounds, a career-high 10 assists to go along with one steal in 31 minutes in the win vs. Boston (12/30/12).